Provided by the Des Moines Register. Used with permission. 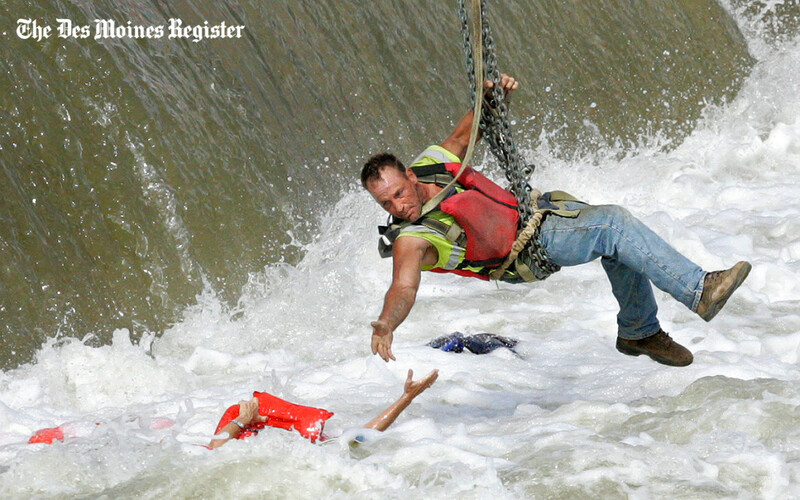 The Pulitzer-winning photo of the river rescue in downtown Des Moines: Patricia Ralph-Neely is pulled from near the Center Street dam by construction worker Jason Oglesbee on Tuesday. A rescue team from the Des Moines Fire Department tried several times to rescue the woman but could not get close enough. One split second captured in a photograph defined the dramatic rescue of Patricia Ralph-Neely below Des Moines’ Center Street Dam on June 30, 2009. The photo became iconic and won the Pulitzer Prize for then-Register photographer Mary Chind Willie. But Willie wasn’t the only Des Moines Register photographer out taking pictures that day. Then-Register photographer Andrea Melendez took photos of the rescue as well, but only Willie’s photo won the Pulitzer. The podcast is part of an IowaWatch Connection-Humanities Iowa series on Pulitzer Prize-winning Iowa journalism. The series is part of the Pulitzer Prizes Centennial Campfires Initiative, a joint venture of the Pulitzer Prizes Board and the Federation of State Humanities Council and Humanities Iowa, a state affiliate of the National Endowment for the Humanities in celebration of the 2016 centennial of the Prizes. The Iowa Center for Public Affairs Journalism—IowaWatch was awarded a $4,500 Humanities Iowa contract as a partner in the Pulitzer project. IowaWatch selected the topics covered in IowaWatch Connection programs and how to report them. Other Iowa media outlets involved in the project are Iowa Public Television and Iowa Public Radio. “As a photographer there are so many instances where you do work and you put out a good effort and for whatever reason, beyond your control, it may not run or it may not be published in the proper way,” said Willie, of the recognition her photo received instead of Melendez’s. But Melendez, a good friend of Willie’s, said her friend deserved the prize. “She’s a great photographer. She’s one of my best friend. And she deserves it,” Melendez said. The IowaWatch Connection, a statewide audience engagement program, is sponsored by the Iowa State Bar Association. This program involves developing a weekly, statewide news and public affairs radio program and series of community forums that reach a broader audience for the stories IowaWatch reports. Catch up with our latest developments here. Iowa’s economy is a mixed bag. The agricultural sector is in a slump and gaps exist in worker training and skill sets, but other elements are on the rise.